In our current featured ANS article, author Pamela Bjorklund, PhD, APRN, CNS-BC, PMHNP-BC draws on personal experience and scientific literature to develop a commentary on nursing’s relational core in the context of growing digital technologies. The article, titled “Gossamer Threads: Commentary on the Impact of Digital Technology on the Developing Brain and the Capacity for Empathy” will be available for free download on the ANS web site while it is featured! We encourage you to take advantage of the opportunity to read this interesting article, and then return here to share you comments! This article attempts to find points of nexus between seemingly disparate bodies of knowledge from diverse areas including technology, metaethics, moral responsibility, the art and science of empathy, relational theory, technology, and nursing. 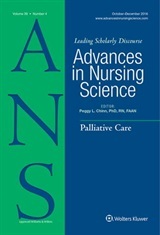 While the scope is intentionally broad and the essence of the paper is intentionally interdisciplinary, it has important implications for nursing—with its relational core, its unique as well as shared bodies of moral and scientific knowledge, and its interprofessional health care goals to maximize human growth and well-being across the lifespan in both health and illness. In reviewing the research for this paper, the threads that connected these disparate bodies of knowledge initially seemed tenuous, fragile, gossamer-like. I envisioned the spider webs on grass and shrubbery that are only seen when certain conditions—the morning light and the dew—render them visible. Although the scope is broad, the focal point of the paper is more narrow: namely, that science shows mixed effects of technology on brain development and on the development of empathy and other meaning-making human skills—and that a more intentional use of technology may better serve human development in the long-run. This does not impugn the undeniable value of technology to human endeavor. My position is already a both/and, not an either/or position. Technology is indispensable; it isn’t going to go away, and who would want it to, given its overwhelming benefits? However, human beings have some capacity to be intentional about the use of technology and to regulate its impact on their lives, which is what I suggest in this paper. Part of what makes this article unusual in its integrations is that it intentionally blends research evidence with personal experience in ways that are unusual for some academic journals. The work has a relational as well as scientific context. The relationship with my daughter, shown in the picture on her 4th birthday and again as a teenager, informs my understanding of the roots of empathy and its role in moral response. The reality is that all research, even the “hardest,” cannot escape point of view. This paper clearly has a point of view, but I have tried to be completely transparent with it. Happy reading, and best wishes to all.